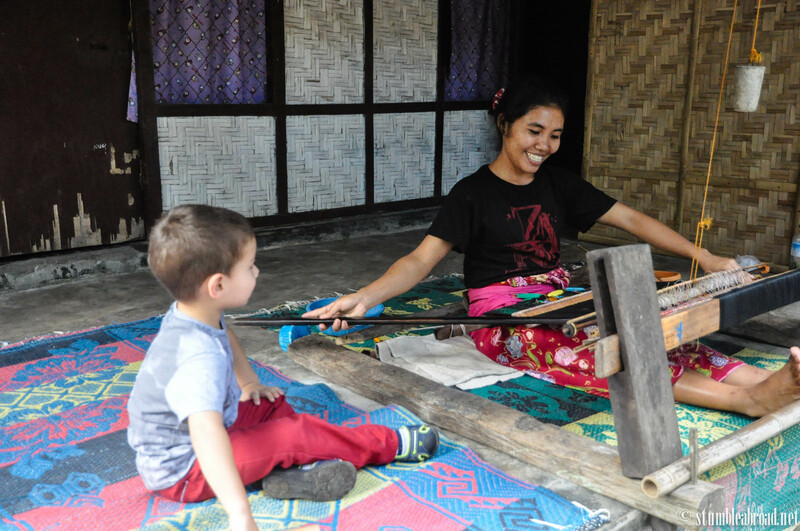 When we first arrived at the small Lombok International Airport we could breathe the fresh tropical air , see the smiling faces of the residents and knew that this was going to be a wonderful trip. We had booked a car to take us to the hotel and the diver offered to give us a short tour of the area surrounding the airport before we headed to the beach area where our hotel was located which was about an hour away. The boys seemed to be in a good mood and the ride was paid for so we agreed to detour off the highway and visit the real Lombok. Out of the different options we were given to choose from, which included wood workers, silversmiths, rice farmers, etc, we asked to be taken to a Weaving Village. 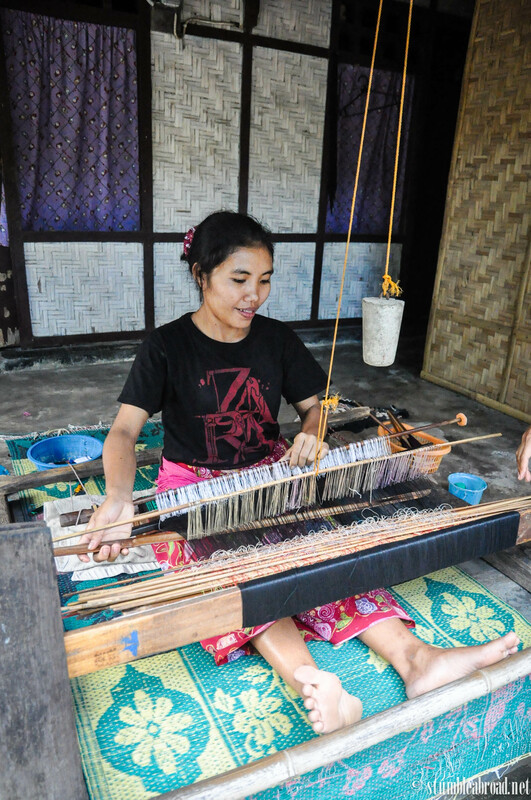 Lombok is famous for the intricate textiles women in co-ops such as the one we visited. 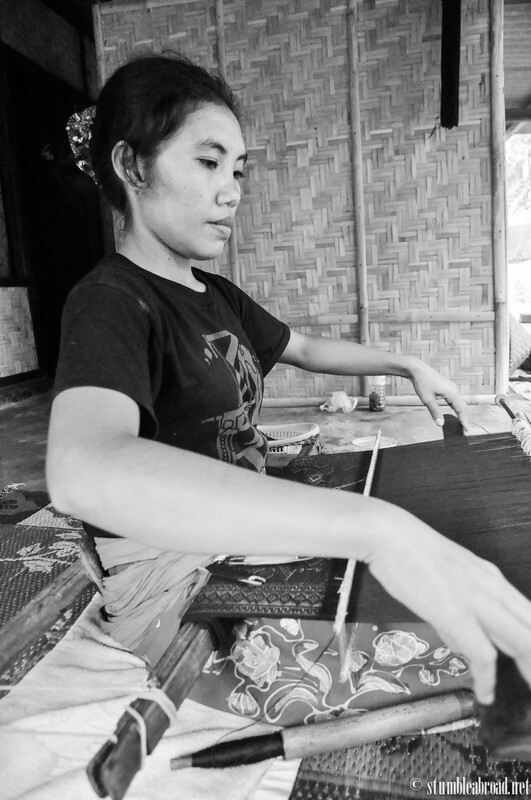 The technique, called tenun ikat, requires not only patience and a steady hand, but heaps of creativity and love for the craft. As we headed down a narrow two-way street we were excited to see were we would be lead to. 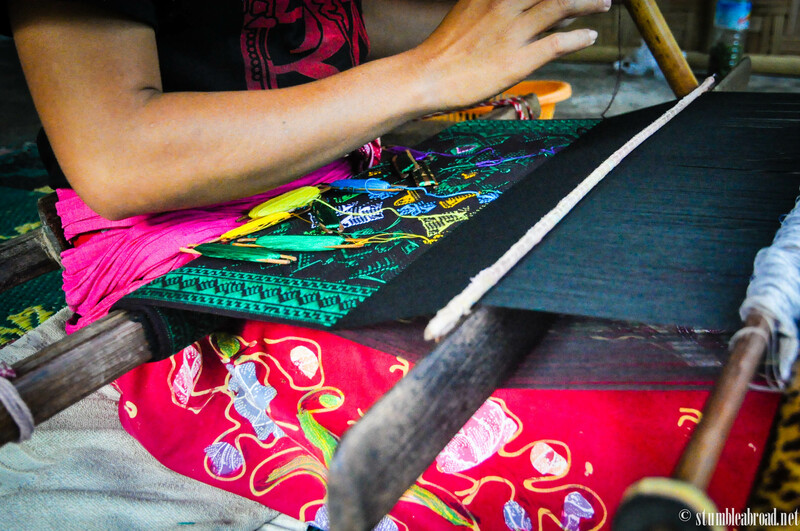 All throughout the ride down that street we saw dozens of women working their craft as our driver explained that weaving and selling textiles is the main source of income for many of the families in Lombok. He also mentioned that only women weave and that young girls are taught the craft from an early age. 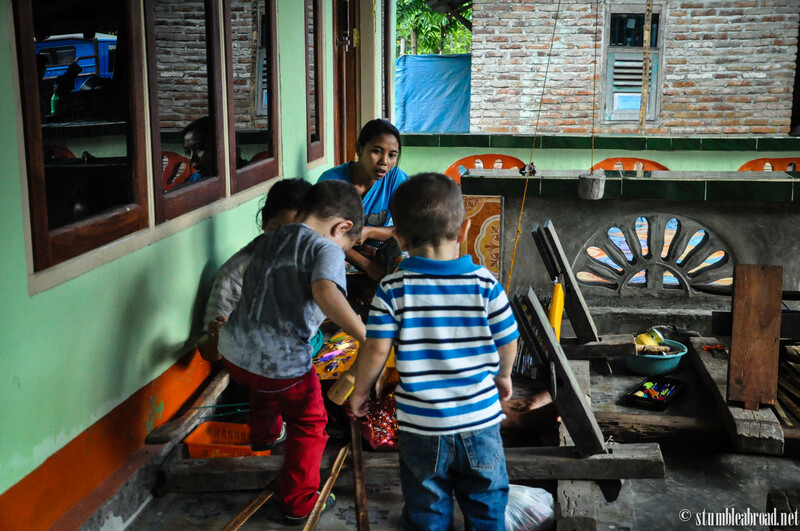 When we arrived at the weaving village I was impressed to see how well-organized and ran the co-op is. 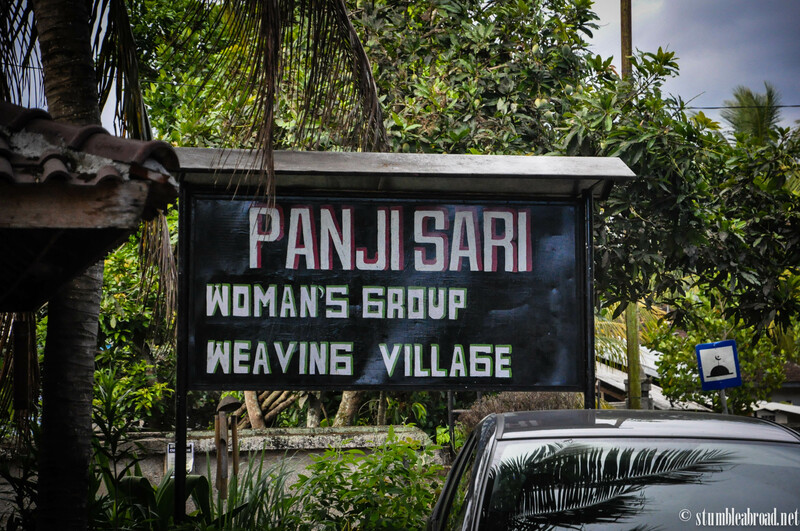 We were told that we could purchase some textiles at the end of our tour and then were led into the weaving village. Evan made friends right away and lead the way with our amazingly well-spoken tour guide. 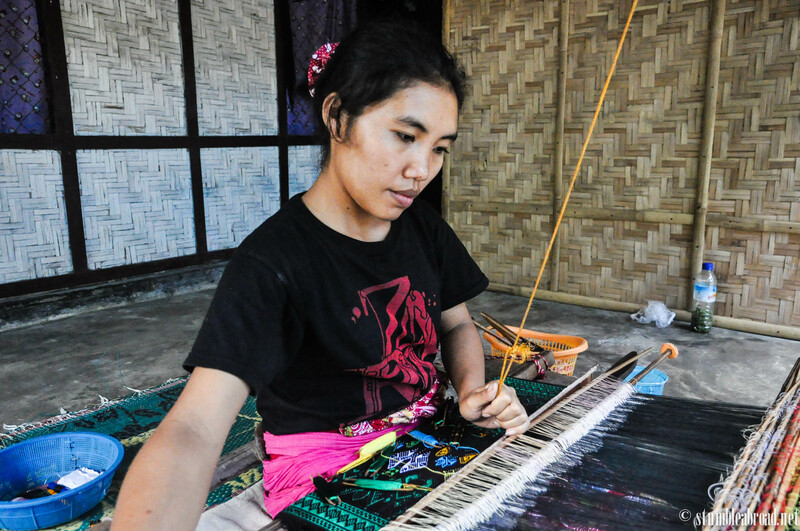 One of the weaving ladies herself. 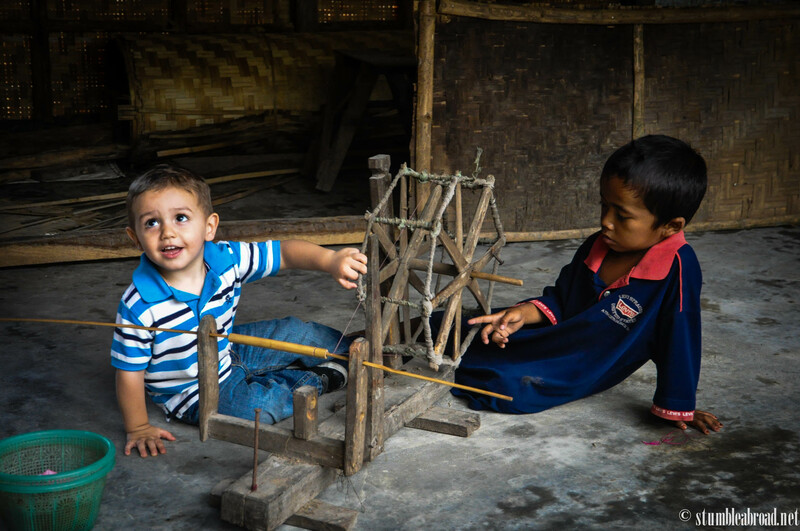 When we went into the kampung the boys got distracted right away by the many furry and feathered friends at the village. 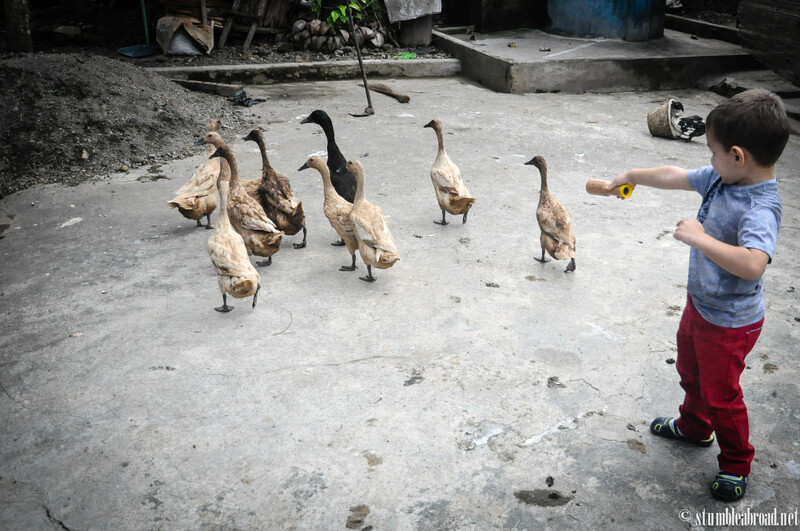 After harassing playing with the ducks for a few minutes we continued our trek into the Kampung. It turned out this was just like a neighborhood where everyone knew each other and supported each other in doing their business. Our first stop was with a lovely lady who shared with us that she had been weaving for over 20 years. She offered to let me and the kids help her weave but I was really concerned we might destroy her lovely piece of art! Our amazing tour guide told us that each of the ladies comes up with their own design and that they don’t follow a pattern in particular. 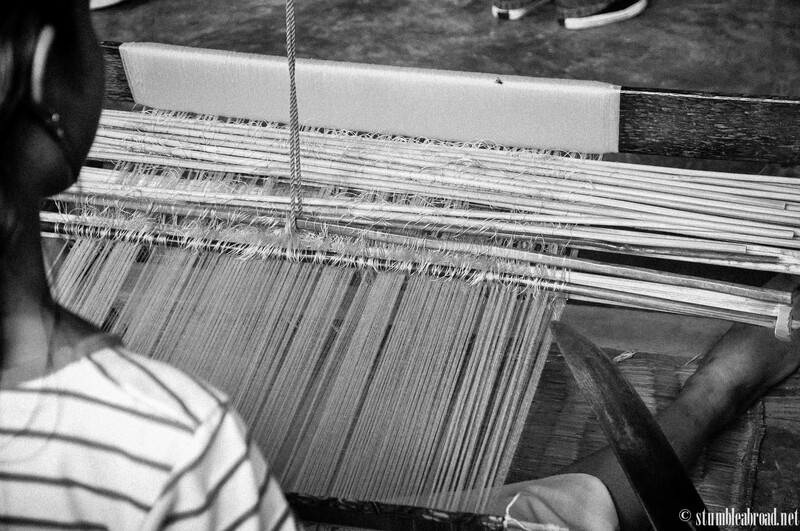 The have to set the design on the loom before they can start weaving over it. Depending on the design, we were told that some take over 5 months of work. These lovely ladies work on their looms every single day from sun up to sun down while at the same time taking care of their families. Most of their spouses are farmers and these strong women take care of the house and offer liveliness to their families. Evan and Joshua was actually very interested in the process and were trying to touch everything. I was just praying they wouldn’t break something! The ladies were so sweet and their kids were very intrigued by the bule (foreign) kiddos. Evan wanted to play with their bikes and we had to drag them out of several houses. They were already trying to take their shoes off and invite themselves in. Not that this doesn’t happen back home, but at least we do know our neighbors. 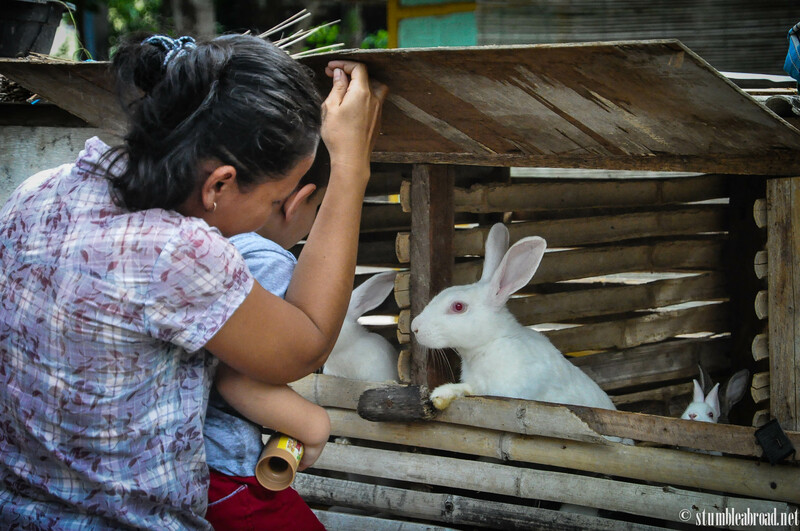 A quick stop to look at the bunnies later we headed further in the kampung. As we walked by we saw so many ladies working on their craft. 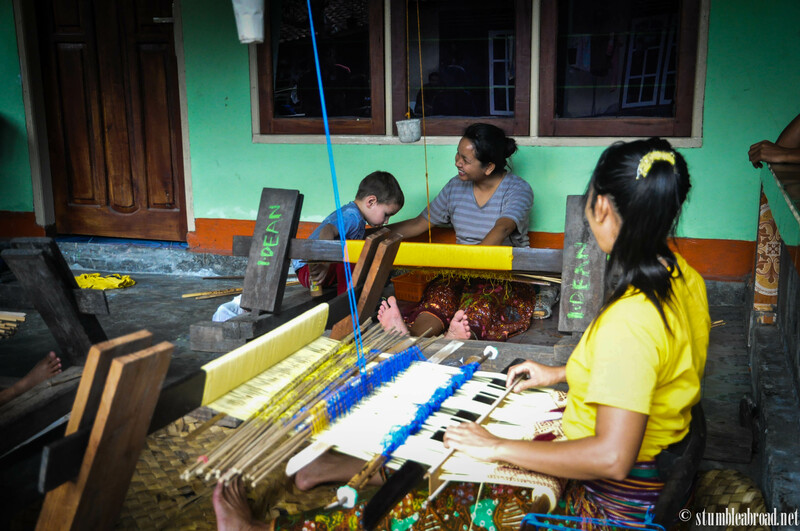 Our guide took us over a small stream which was obviously too tempting for the boys not to splash their feet in and we got to another section of the neighborhood where a group of ladies was chatting the afternoon away while working on their hand-weaving. The ladies here were so sweet and the boys jumped right into their work space. I was naturally mortified they would end up breaking something but they actually behaved pretty well and just walked around and explored. We were offered to go further into the kampung but the boys were started to get tired and we knew we had about an hour long ride to our hotel. 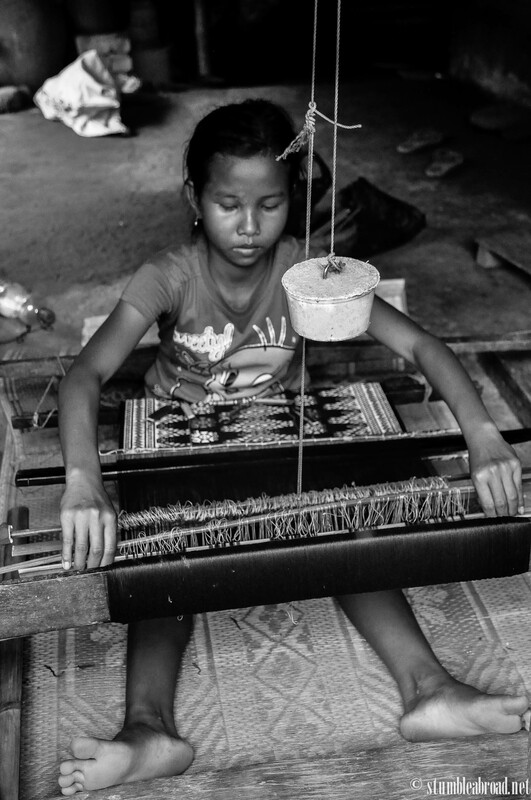 We made one last stop to observe a young girl work on her textiles. The guide told us that in order for them to be able to get married they need to be able to weave. Little girls are taught the craft as early as 8 years old . This girl was making a beautiful table runner and I was very concentrated on her craft. As we were about the leave the boys had to make a quick stop to meet a new friend and play with the thread warping mill. We let them play there for a bit and then went our way. As we were about to leave we made a quick stop at their store. I was surprised to see they even took credit cards. They had many lovely designs and I got a simple dark blue ikat style table cloth. The fabrics with gold and silver thread are pricier and there is something for every taste. I was very happy to contribute at least a little bit to this village. The tour was so nice and we didn’t have to pay anything to visit so the least we could do was to buy a piece or two. 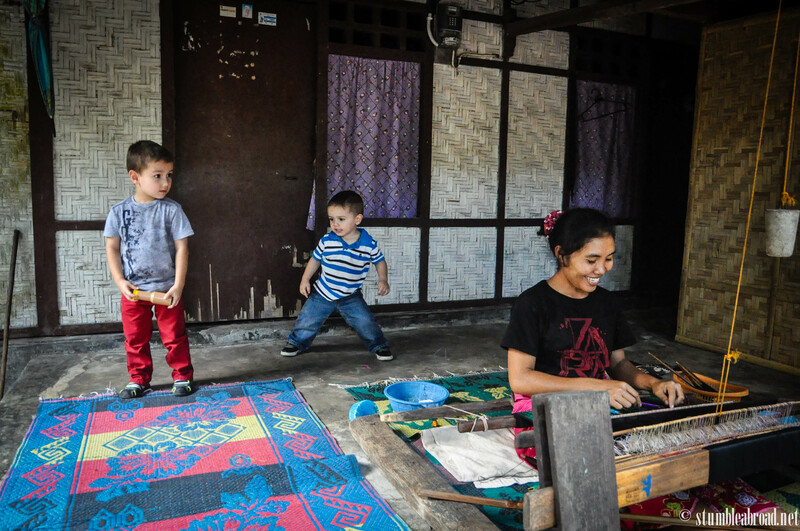 Visiting Lombok turned out to be one of our favorite experiences in Indonesia. Not only was the beach gorgeous and the diving divine, we were very fortunate to have the opportunity to explore even further and learn a bit about different industries thriving in Lombok. 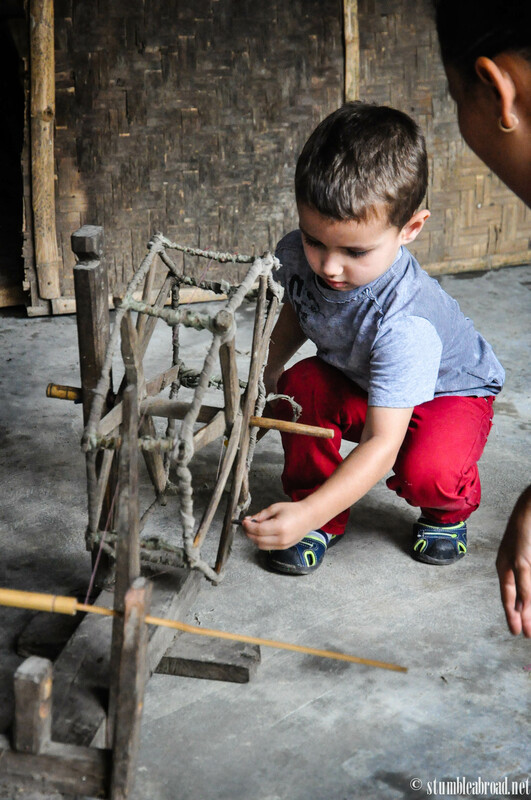 From pearl culture to weaving and rice farming we were very happy to be able to witness how an island ensures its liveliness with the work of their hands. 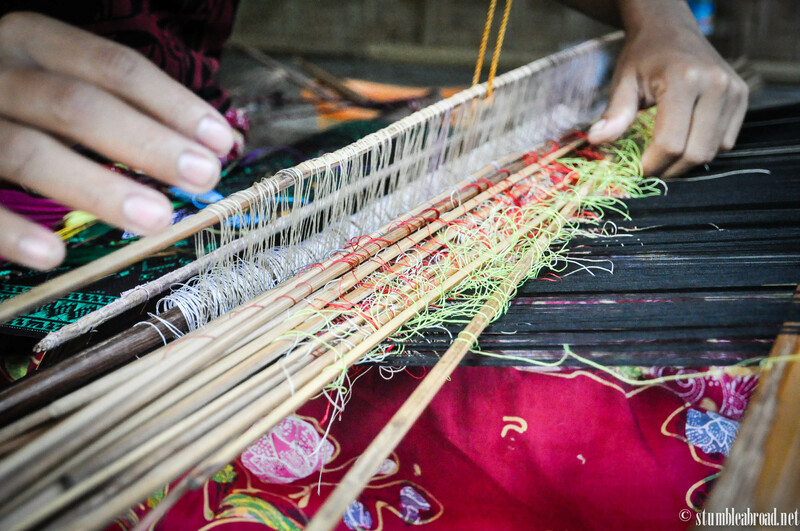 Stop at any of the weaving villages when you are close to the airport. Otherwise you will have to drive back from Sengiggi of the Gilies and that will take you a while. Be braver than I was and give weaving a try. Apparently once the design has been loomed in there is no risk of messing up the design. Be ready to bargain a bit if you plan to buy something. The prices are quite excellent compared to Jakarta but if you are making a big purchase make sure you get the best deal. There are no restaurants nearby so plan your schedule if you are considering doing a full-day trip. Gorgeous photos!!!! I love Lombok, too! Thanks Kaho. We didn’t really plan to see anything in particular and were very glad to have had the option of visiting this place. Take care! THanks, Maureen. I fell in love with Lombok. I really want to go back! This is so amazing that it makes me emotional! 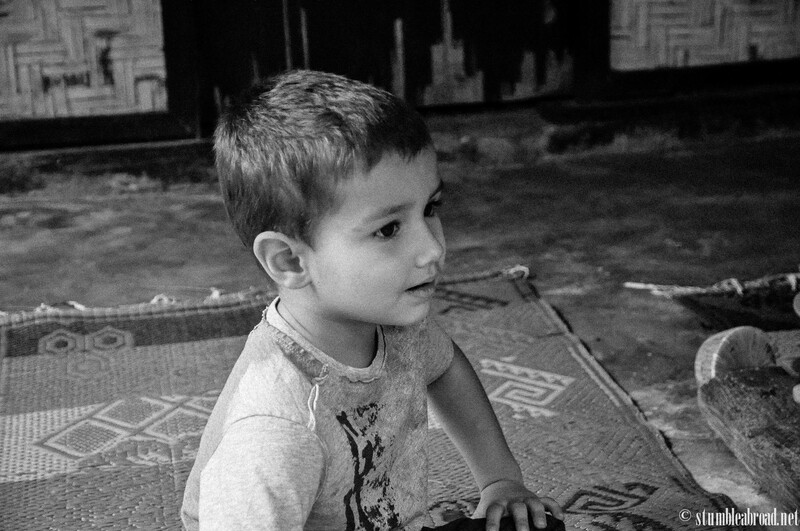 What a beautiful experience for a child and a family! I dream of traveling around the world as a family! Thanks Deb, you should! The girls would enjoy it and so would you! 🙂 By the way, the are so big and beautiful!!! xoxo! 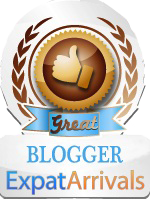 Oooh, love your blog and will be reading more of your posts. 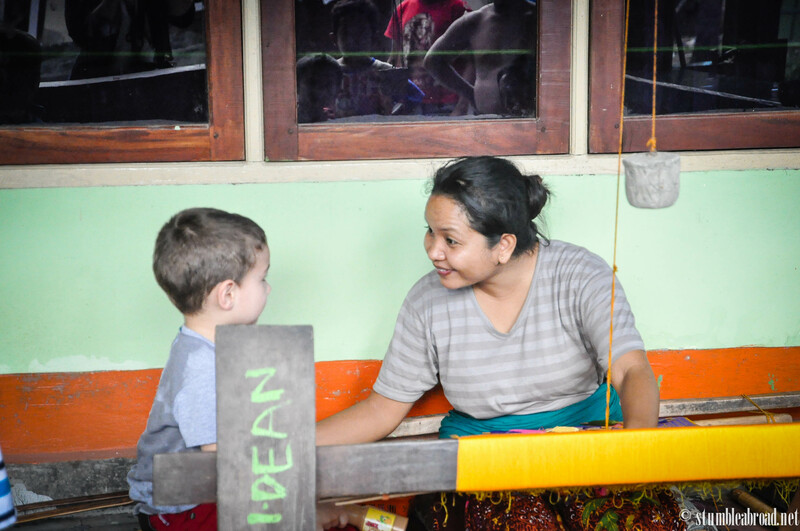 Taking my 4yr old and 1 yr old to Indonesia next year and am looking for all the tips and ideas I can get. Thanks! Dear Carissa, thank you so much for your kind comments! Please let me know if you have any questions before your move. Warm regards! Hi Carissa, Indonesia is a wonderful country worth exploring! I hope you have a fab time planing your trip and coming to visit. Take care! 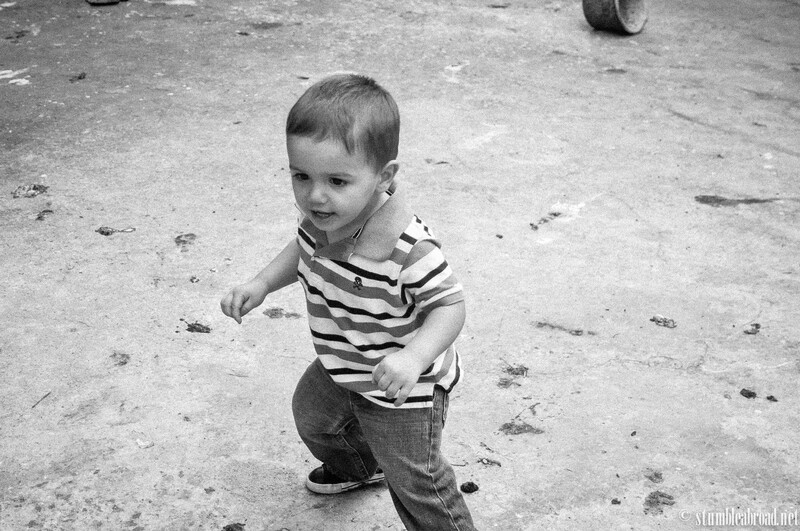 Aaaaah super cute, josh! 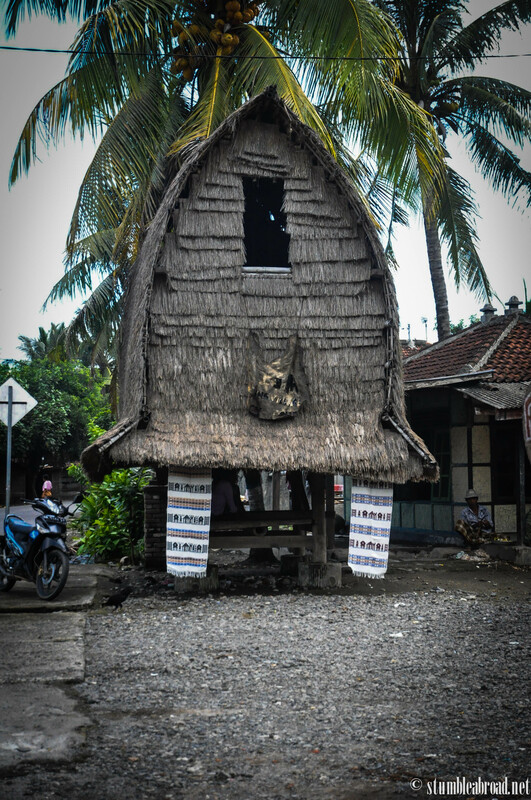 I love Lombok and travel like a local, too!